“Risks could arise following a sharper downturn of the real estate market. 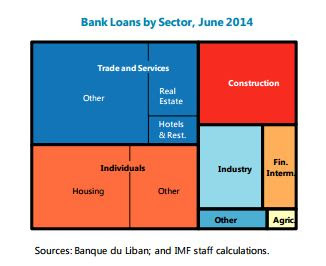 A sizable fraction of bank loans to the private sector have been directed at the real estate sector, where activity is softening. But, in the absence of a price index, the number and value of property sales can serve as a proxy for the housing cycle. Both indicators grew by close to 3 percent in 2014. This is slightly more than the 2009–14 average for the number of transactions, but well below the past average for the value of sold properties (around 11 percent)”, says the IMF’s latest report on Lebanon.